Pammy Blogs Beauty: Fragrance Review: Inis "Energy of the Sea"
Fragrance Review: Inis "Energy of the Sea"
Today I am reviewing a beautiful scent from an Irish perfume maker, Inis. 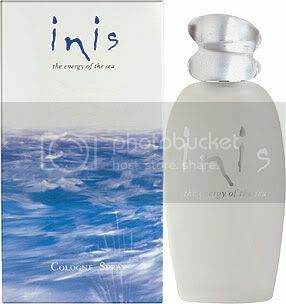 I have been testing out Inis's top selling fragrance: "Energy of the Sea". I know, it is so hard to capture a fragrance in words, sometimes you just need to smell it in person! With that in mind, I have included information about how you can sample this lovely perfume for yourself! As the name implies, this scent was designed to evoke images of the sea. When I think of the sea, I think of crisp cool water and a fresh ocean breeze. Inis captured the sea well with this crisp and fresh scent. Top Notes: Neroli, Sicilian Lemon, Bergamont, and Marine Notes. Energy of the Sea is packaged in a pretty frosted glass bottle with a Lucite clear cap. It comes in 1.0 oz, 1.7 oz, and 3.3 oz bottles. Energy of the Sea is such an "easy to wear" fragrance. Its scent is nice and not overpowering. I feel like I just feel clean and fresh when I wear this. I love wearing perfumes, but often my perfumes seem too "heavy" for daytime. Well, not the case with Energy of the Sea. I enjoy wearing this as an "everyday" scent. It is just so "easy" to wear! I am thrilled that I have found a daytime/work-appropriate scent. Guys, you are not left out! This is actually a unisex fragrance. I can see how this clean scent might work well for both a man and a woman. Although, my husband tends to prefer colognes heavier than this one (but everyone is different!). 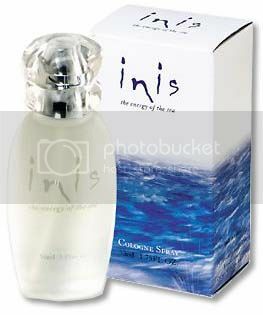 Inis Fragrances are available on perfume.ie and Fragrances of Ireland. Prices range from $20-$50.00. Interested in trying Inis "Energy of the Sea" for yourself? You can get an "almost free" sample here (note: this does require a small purchase but you will get that fee discounted back if you end up purchasing a full size). I really enjoyed testing out this lovely scent. I will continue to enjoy wearing this! Sounds lovely :) Sometimes it's nice to have something uncomplicated and casual to throw on! @Larie-Yes, exactly! :) Thanks for the comment! Ahh all the samples were sold out...but I'll keep checking! I don't mind paying for a sample since some fragrances don't mix well with my migraines! @Manicured Slayer-I hear ya, sampling is a must for fragrances. :) We dont want to trigger any miagranes!